Nothing compares, this is truly a once off opportunity. Simply a breathtaking location – spectacular sea views. Circa 3 acres directly fronting the beach. 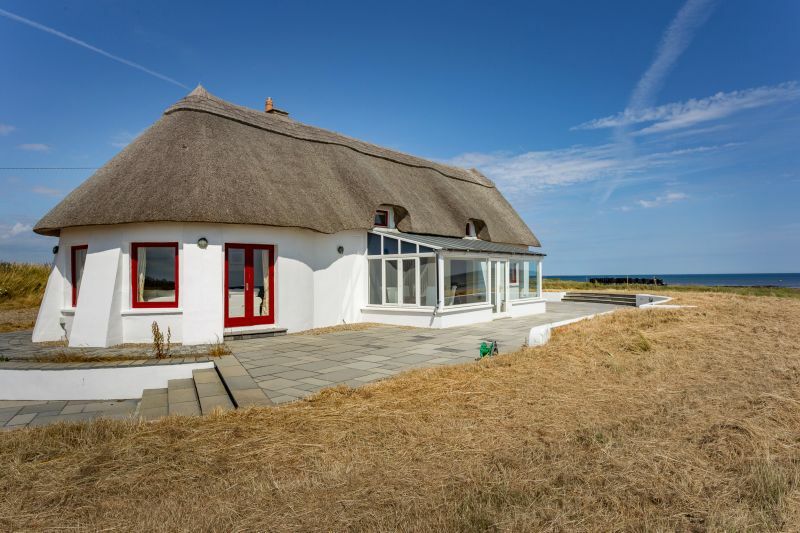 A traditional thatch cottage in superb condition on a beachside site of circa 3 acres with the most stunning views of The Saltee Islands, St. Patricks Bridge and out to sea. A totally unique opportunity where planning permission is virtually impossible to obtain now in this cul-de-sac location, 10 miles south of Wexford Town, beside the village of Kilmore Quay with its new marina, traditional pubs, excellent fish restaurants and the wonderful coastal walks along the nearby burrow. Simply a breathtaking location – circa 3 acres directly fronting the beach to which there is easy access, totally private and manageable grounds. The thatch cottage is refurbished to a high standard providing light filled and well proportioned accommodation. There are most spectacular sea views from the living room and bedroom accommodation. Nothing compares – this is truly a once off opportunity, a real gem, a hide-away literally on the beach yet just 20 mins. drive from Rosslare International Ferry Port and just over 2 hours from Dublin, beside the best fishing village in County Wexford. Entrance Porch 1.45m x 1.30m With Terrazzo tiled floor. Kitchen 5.52m x 5.42m Excellent range of built-in floor and level units, granite worktop, Rangemaster cooker, Belfast sink, dishwasher, American style fridge freezer and island unit/breakfast bar. Terrazzo tiled floor. Stairs to first floor. Sun Room 6.67m x 2.77m With two sets of French doors to patio area and Terrazzo tiled floor. Uninterrupted views out to sea and The Saltee Islands. Study 2.56m x 2.17m With timber floor. Sitting Room 5.67m x 4.89m (ave.) Circular room - with gas stove, timber floor and French doors to garden. Hallway 4.31m x 0.89m With timber floor. Shower Room 2.38m x 2.07m Shower stall with power shower, vanity w.h.b., w.c., heated towel rail. Part-tiled walls and tiled floor. Bedroom 1 3.70m x 2.58m With timber floor. Bedroom 2 2.67m x 4.00m With built-in wardrobes and timber floor. Spacious Landing 3.04m x 2.90m With timber floor. Bedroom 3 4.20m x 5.30m With exposed beams and timber floor. Shower Room 2.98m x 2.21m Tiled shower stall, w.c., w.h.b. and built-in storage press. Tiled floor. (ave) Circular room with vaulted ceiling and timber floor. Utility Room 7.38m x 3.37m Built-in storage presses, washing machine, tumble dryer, gas boiler. Double timber doors, pedestrian door. Tiled floor and vaulted ceiling. Spectacular circa 3 acre beachfront site. Views over The Saltee Islands, St. Patricks Bridge and Kilmore Quay Marina. Gardens in lawn all around.